Ever dreamt of what it would be like to be a zoo keeper? Well now’s your chance to get stuck in and work with a real-life zoo keeping team! Experience the once in a lifetime opportunity of working with animals for £150 for one person or £250 for two. 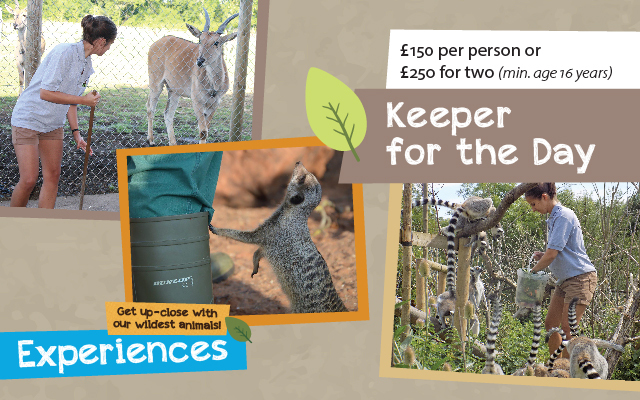 Get set for adventure and become a Zoo Keeper for the Day in one of the most natural wildlife parks in the UK. Set on 136 acres of land, we’re one of the only wildlife parks in the UK to offer a day of one-to-one interaction with a keeper, allowing you to experience life in all of our animal sections. Soak up fascinating animal husbandry facts from our highly experienced keepers, whilst learning all about the challenges our animals face in the wild and the work we do to support them. The opportunity to learn about a wide variety of animal species and ask our knowledgeable keepers all about our animals and conservation programmes in the UK and worldwide! By buying this special gift, for yourself or for someone else, not only will it be an experience to remember but you will also be contributing to our conservation work both here and around the world helping to save animals from extinction. This experience is for ages 16+, if you are interested in our junior keeper experience please click here. Availability for our Zoo Keeper for the Day experience is limited so we recommend booking early. The experience is available for adults over the age of 16 years old. Please note that the spectating guest will not go behind the scenes; however there will be the opportunity for them to take fantastic photos of the participant whilst visiting various areas of the park. Regrettably certain guests will be unable to take part including people with epilepsy; relevant phobias or known allergies; pregnant women and immunocompromised individuals. Whilst every effort is made to accommodate those with a disability or learning difficulty, due to practicality and health and safety this cannot always be achieved; please contact us for advice before purchasing.